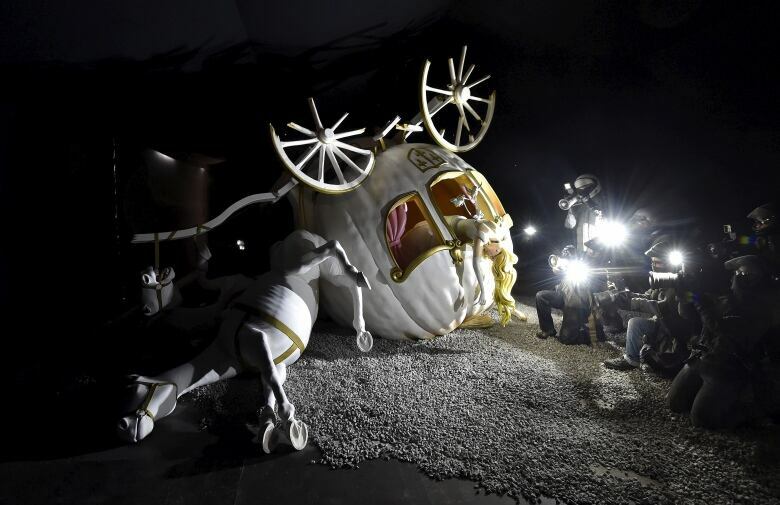 Banksy's Dismaland themepark is an overwhelming funhouse of twisted art, and among the contributing artists is Montreal's Maskull Lasserre. Hear how this inventive sculptor was recruited for the project. How do you become a part of Dismaland? Banksy sends you an e-mail. That's what happened for Montreal's Maskull Lasserre, an inventive sculptor who transforms everyday objects into items that are unsettling, beautiful – and almost always winkingly funny. Earlier this year, Lasserre was recruited as one of the "imagineers" for Dismaland, Banksy's dystopian theme-park/art expo. Five of Lasserre's pieces appear in the project, which caused a sensation when it was unveiled Thursday. "I was just invited, sort of out of the blue," Lasserre says, recalling how it all started. Banksy "was interested in my work, and we began a conversation from there." That was in February. Monday, Lasserre arrived in Weston-super-Mare. It's a small resort town about an hour from Bristol, the rumoured hometown of Dismaland's notoriously anonymous creator. In decline since the '70s, Banksy reportedly played there as a child, but its long-abandoned amusement park has since been transformed. 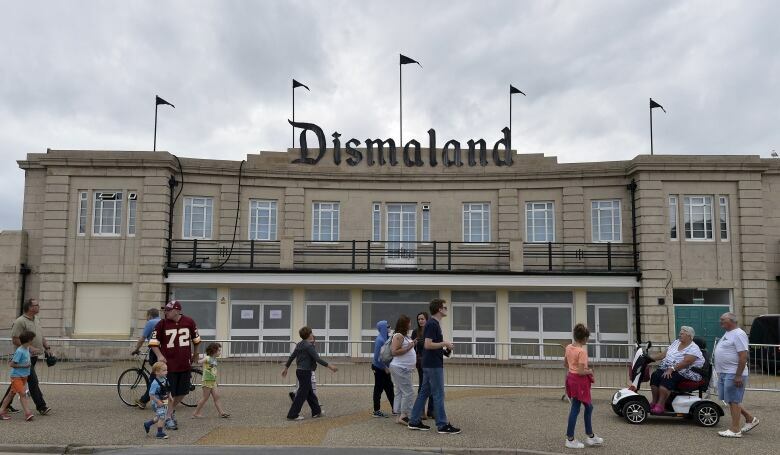 Lasserre, along with more than 50 international artists, and a Banksy-led crew, began assembling Dismaland this week. It's a place as magically bleak as its title implies. Saturday, following a "locals only" day, Dismaland opens to the general public. Previews reveal a bombed out Cinderella's castle, where you'll find a Banksy sculpture of the princess, her pumpkin-carriage overturned, beset by paparazzi. 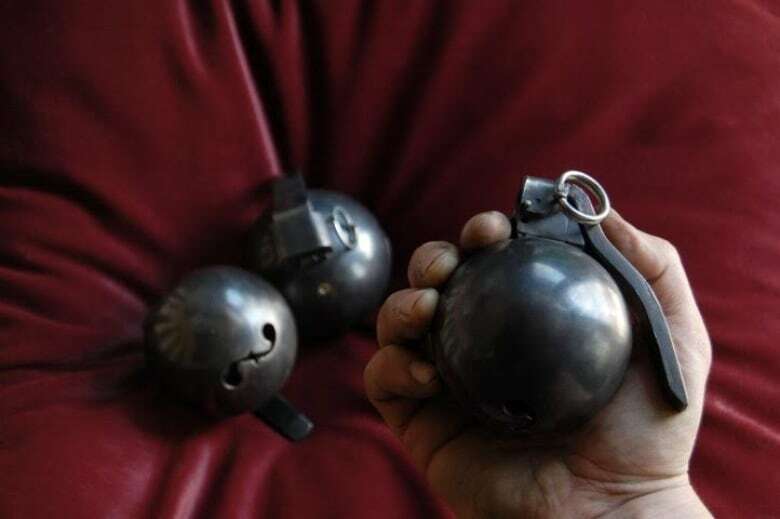 There's a 50 Shades of Grey-inspired Punch and Judy show; remote-control refugee boats; carnival games where a stale fish-finger, not a goldfish, is the prize. For roughly $10, you can even learn how to post propaganda of your own; someone will teach you how to break into bus-shelter ads (and you can take your tools home). CBC Trending has a gallery of all the twisted sights. 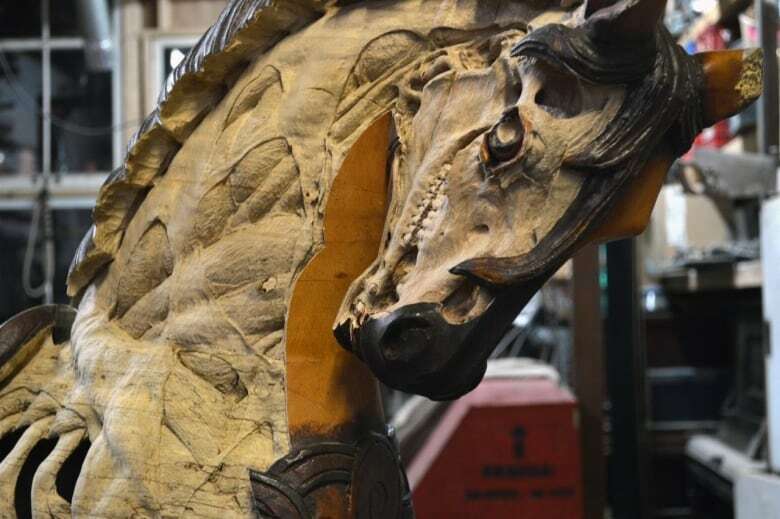 Most of Lasserre's five sculptures can be found in the park's gallery space, the most traditional viewing area in this sprawling, satirical funhouse. A few more are scattered in more unexpected spots. 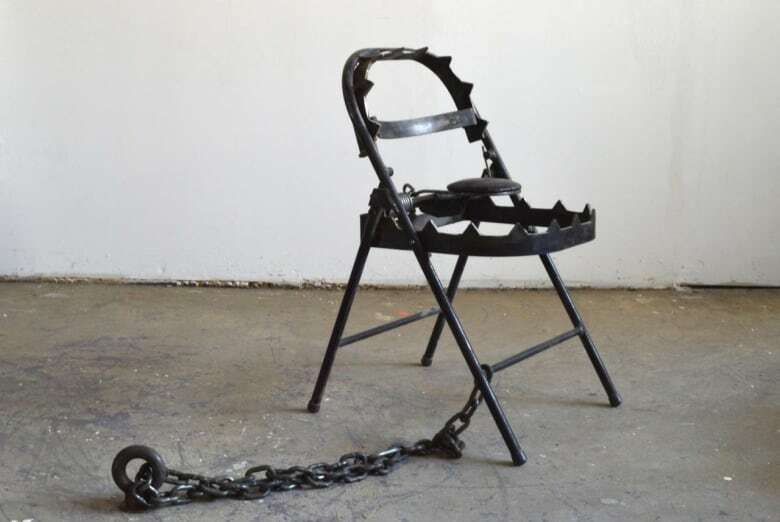 Progress Trap, for example, a 2014 sculpture of a folding utility chair whose seat has been transformed into a toothy bear trap, appears in a tent "with a number of other sort of subversive furniture objects – and a Damien Hirst unicorn in a box." When first contacted about the project, Lasserre wasn't told much. He got some "broad stroke" details. The gist: Banksy was creating "an abandoned theme park." "Banksy suggested a couple of works, I offered a couple, and then we came to a consensus about how they'd fit within the context of the rest," Lasserre explains. The requested items? 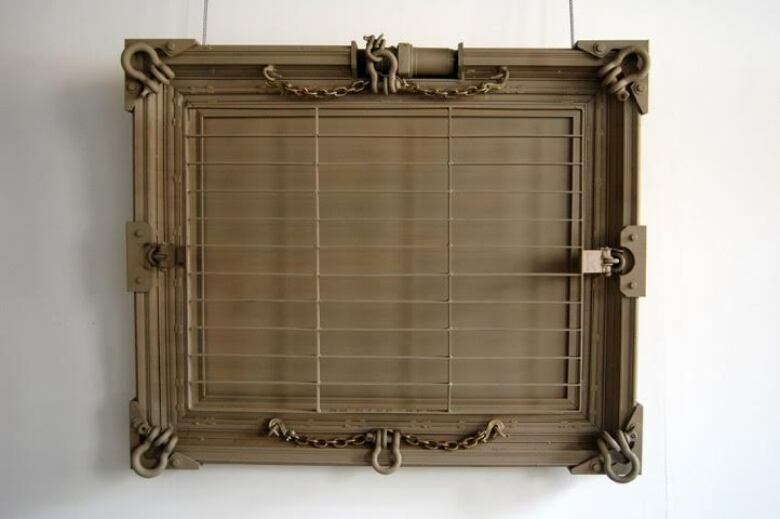 Grand Narrative, which Lasserre describes as "a picture frame crossed with an armoured personnel carrier." Lasserre spent the spring of 2010 in Afghanistan, participating in the Canadian Forces Artist Program. The sculpture was developed during that time. And then there are Lasserre's own suggested contributions, one of which you'll see in an upcoming episode of CBC Arts series The Re-Education of Eddy Rogo. It's called Beautiful Dreamer, and it's a series of spherical hand grenades. If you pull the pin, music will play. But only once. "You're faced with this debate about whether or not to deploy the work and lose it in the process." An original sculpture, created especially for the show, appears in the gallery, too. 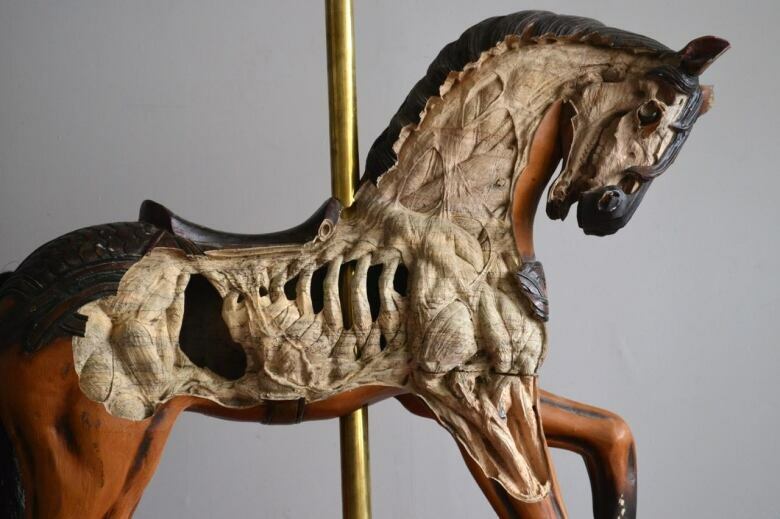 It's a dissected carousel horse called Janus. Lasserre has painstakingly carved its grinning skeleton into the painted wood, and its creation was a moment of major serendipity. The week before receiving Banksy's e-mail, Lasserre had bought the antique at a Mississauga garage sale. 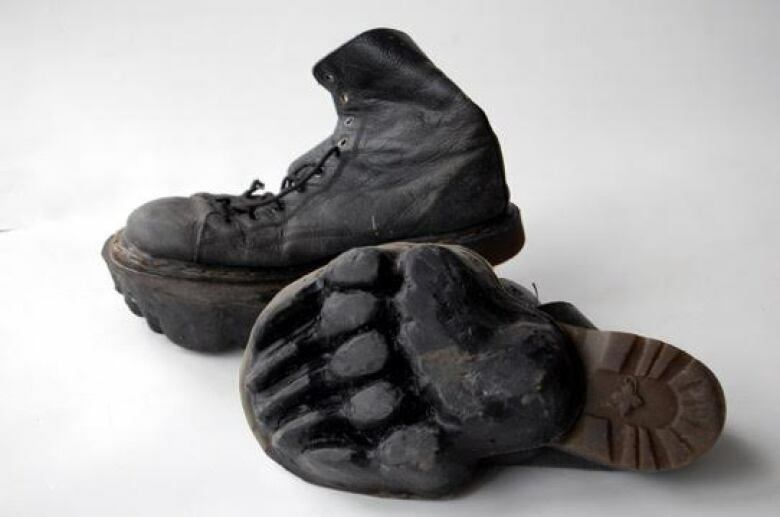 "It seemed appropriate for the theme of the exhibition," Lasserre deadpans. 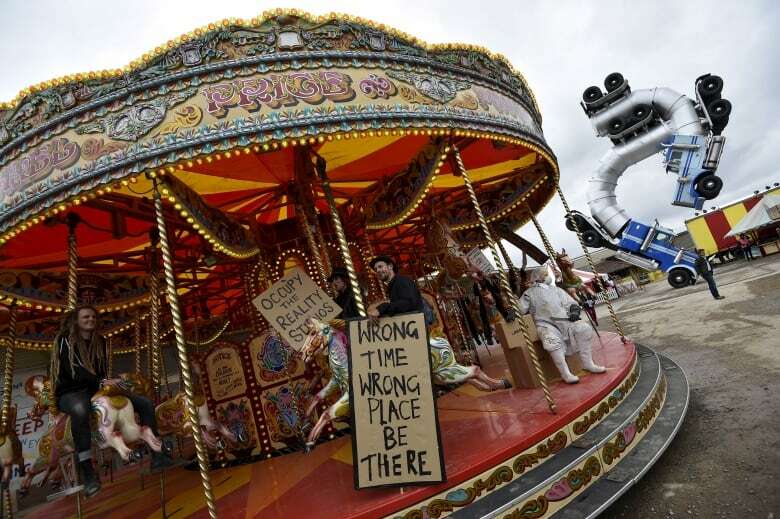 Banksy has declared that Dismaland is "an art show for the 99 per cent who would rather not be at an art show." It's a statement Lasserre connects with. "I have to say that, despite the fact that I spend my life making these things, I probably spend an embarrassingly little amount of time going to galleries and looking at other art," he says. "So this is naturally interesting to me," he says of Dismaland. "So this is naturally interesting to me because it's quotidian in some sense. … It's in some ways much more immediate than a gallery experience. In that way I can understand it." Demand for tickets has been unsurprisingly high, and the official website crashed soon after general sales began. Admission is a mere $6, and 4,000 tickets will be available each day until the spectacle closes on Sept. 27. Lasserre's experience of the Dismaland park has been, in a word, "overwhelming." "One's never sure if you're looking at the legitimate article or some subverted artwork. It's quite disorienting in several ways, and I think that's the value of it," he says. "For me, anyway, it has this satisfying effect, in that when you leave this environment, and walk down the pier, into the town, you kind of observe the rest of reality in this slightly different way. You're a little more suspicious of everything around you, having gone through this environment that's so heavily laden with irony and social critique and these other prerogatives. "In terms of the spectacle of this whole thing, it's definitely beyond my experience."